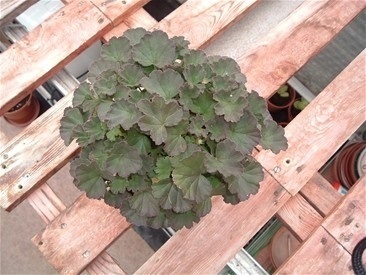 This is a plant of Erwarton showing discolouration of the foliage, caused by lower than average temperatures in the greenhouse. I find that quite a few of the Miniatures are affected by this, the darker leaf with a strong zone like Sussex Gem can go nearly black. This does not bother me as once the weather gets warmer, it will grow out and the plant will be back to normal. 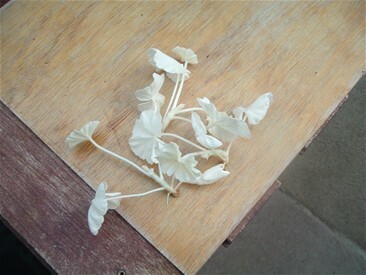 The white growth in the picture was taken from a Bicolour Zonal. Just for a want of a better word I will call them 'GHOSTS'. I remove them as soon as I see them starting to form. They are not green and white so will lose points when that plant is judged. The leaf below shows rust spores, I have been lucky and not seen any for a number of years in my greenhouses. This leaf was on a plant I bought from a nursery, luckily I keep any bought plants seperate for a few weeks. I removed this one leaf and sprayed with Dithane 945, this normally does the trick. 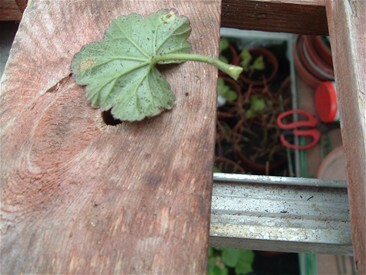 By giving plants plenty of space in between them, and opening windows and doors whenever I can helps prevent rust. Also a fan to help circulate air is handy for those days, when the windows and doors cannot be opened. 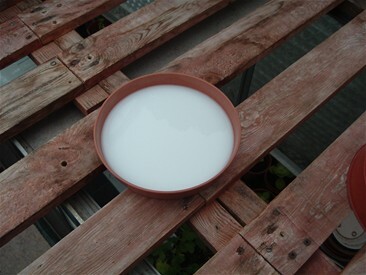 If my plants are good they get a saucer of milk. 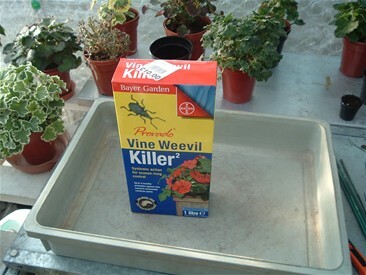 I use Provado as it is a systemic, and find it controls whitefly and greenfly well, so much so, that since using it I have not seen any pests on my plants. 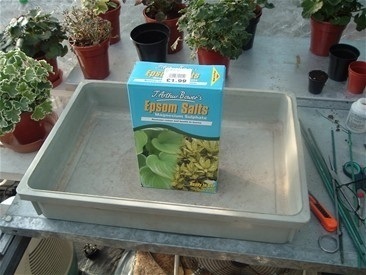 A regular application of Epsom Salts helps combat magnesium deficiency and keeps foliage looking healthy. I find that Epsom Salts dissolve better in warm water.